Every day, billions of people searching for billions of things on Google, Bing and other search engines. If you’ve ever written an article on the internet, and you have not time traveled here from the year 1998, you know what a Google snippet is. If you have time traveled here from the year 1998, we should probably catch up on what inbound marketing is before we go much further. Someone who has just searched for garden gloves can infer that your page must have something to do with their query, but they have no way of knowing what on earth your page is about. If the next listing down helpfully includes information about garden gloves, you just lost a click. And let’s be real: If you don’t have snippets that are worth clicking on, all the SEO effort you’re putting in on your website is just about worthless. A better listing might look more like this, complete with specific information about the page and what you offer. It’s a more appealing and ultimately clickable snippet, and that’s what you want to offer. You can do that and get by, SEO-wise, if you’re smartly optimizing your content and following best practices for getting found online. This being Google, though, you will not be surprised to learn there’s a lot more you could be doing with your snippets. Namely, rich snippets. Rich snippets allow search engines to better understand what information they are serving up and for viewers to get more information to help them find what they’re looking for. They are the result of adding structured markup data to your web page’s existing HTML. Correctly implementing markup data to your content might not immediately lead to better rankings, but it will make your search results jump off the page. And if your page delivers what your search engine result says it will, chances are you’ll have a lower bounce rate, a higher click-through rate, increased traffic, and eventually improve your SEO ranking over time. That’s particularly critical if your page is a big part of your conversion funnel (or flywheel, this being 2018), and you need users to stick around. First, you should know what you can do with markup, which is a fancy way of saying “adding new stuff to your snippets.” To do that, you’ll need to add code to your website that Google’s adorable little spiders can crawl over and make off with to improve your listings. This code is…lengthy. If you’re using WordPress, getting your hands on a plugin like All-In-One Schema is a move that will save you a lot of time, headaches, and general bewilderment. If you’re not, enlisting an in-house or outside developer is more or less a necessity. That’s especially true because you don’t want to piss off Google by marking up things that aren’t actually relevant to the page, and you may not know the difference at first blush. If you’re a HubSpot user, know that the platform does not automatically add or natively support Schema markup, but you can use a custom HTML module to add rich snippets. To get started, you’re best off visiting the stellar Schema.org, which has a virtual library of potential markup for your website. The number of things you can do with rich snippets is truly intimidating, and it could take you months to sift through properties and figure out the best way to add them to the site. It’s best to resist the urge to make your listings super fancy and just stick to adding one-to-two rich elements that will actually improve them for your audience. You should also keep in mind, as SearchEngineJournal notes, that your rich snippets may not immediately pop up. In fact, they may pop up, disappear, and pop up again until Google decides your listings are up to snuff. Even then, certain elements may not always display. Be sure to dial your immediate expectations (and that of your team’s) down in light of that, and again, focus on the most essential markup only. In fact, allow for up to eight weeks to start seeing them on a consistent basis. So what kind of markup should you start with? Not to be squirrelly, but it will depend on your website, as your accountancy firm may not have a lot of exciting photos of taxes in action to share. Also, you don’t want to overdo it, as it can look mighty fishy in the eyes of Google. Picture this: Someone searching for businesses in your industry discovers you at spot #3 in a Google listing. They notice you first because you’ve added a company logo, address, telephone number and more. That level of detail will likely set you apart from other listings. If you want to tout reviews for a particular product on a product page or just that five-star rating you’re rocking for your awesome company, this is how you’ll do it. You’ll be able to mark up star ratings and even featured reviews, if relevant, which can help you stand out in search listings in a visual way. 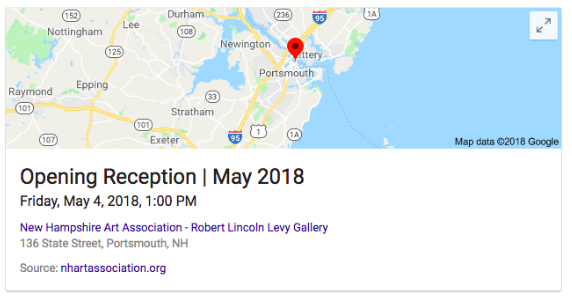 If you’ve got a giant conference or just a major sale, you can create a rich snippet with its name, start date, end date, geolocation, and more. Again, this helps someone determine if they want to take the time to learn more and figure out how they’re going to get to your event. If you have a very well-known CEO or employee, it may behoove you to pull in rich data from LinkedIn. Someone searching for that famous or semi-famous person will know for certain if they’ve found him or her with a headshot, and that allows them to click with confidence. Supported properties might include the person’s name, title, role, professional affiliations, and contact details. 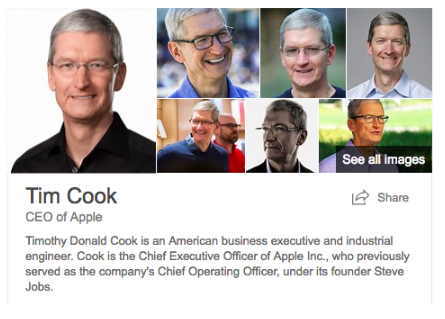 In this case, this is a rich card for Apple’s CEO Tim Cook. If you have a specific product or service page, rich snippets offer the ability to add markup for everything from price points to product details and SKUs. If you can spruce up your product listings with photos or just provide more info on key services, you’ll have a more informed user ultimately clicking onto your site. Rich snippets can also be used to show if a product is worth a user’s time. In the example below, you can see the product name, brand, description, review, price, seller, and other pertinent information. This is definitely helpful when someone’s in the process of trying to make a buying decision. Need a little guidance turning your snippets into rich snippets and winning the day for your company, which will surely shower adulation on you as a result? You can reach out to us directly for best results! In the meantime, check out our guide to getting found online below.